What this means is that you can now have a custom bootup file for each “project” you may be working on (e.g. compositions, MIDI modules, custom OSC setups, live sets, etc). 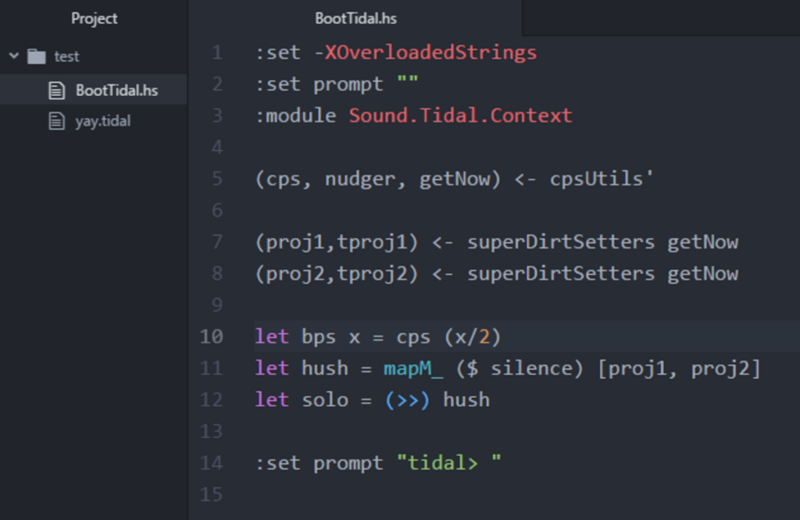 :set -XOverloadedStrings :set prompt "" :module Sound.Tidal.Context (cps, nudger, getNow) &lt;- cpsUtils' (d1,t1) &lt;- superDirtSetters getNow (d2,t2) &lt;- superDirtSetters getNow (d3,t3) &lt;- superDirtSetters getNow (d4,t4) &lt;- superDirtSetters getNow (d5,t5) &lt;- superDirtSetters getNow (d6,t6) &lt;- superDirtSetters getNow (d7,t7) &lt;- superDirtSetters getNow (d8,t8) &lt;- superDirtSetters getNow (d9,t9) &lt;- superDirtSetters getNow let bps x = cps (x/2) let hush = mapM_ ($ silence) [d1,d2,d3,d4,d5,d6,d7,d8,d9] let solo = (&gt;&gt;) hush :set prompt "tidal&gt; "
With these configuration options, you can now have complete control over your own custom Tidal boot code rather than modifying the source code of the package’s boot file.